As Medicaid reimbursements drop in Kansas, fewer dentists are accepting patients and some are leaving the program. Melinda Miner, a dentist from Hays, compiled a map showing more than 20 western Kansas counties without a dentist who accepts Medicaid. 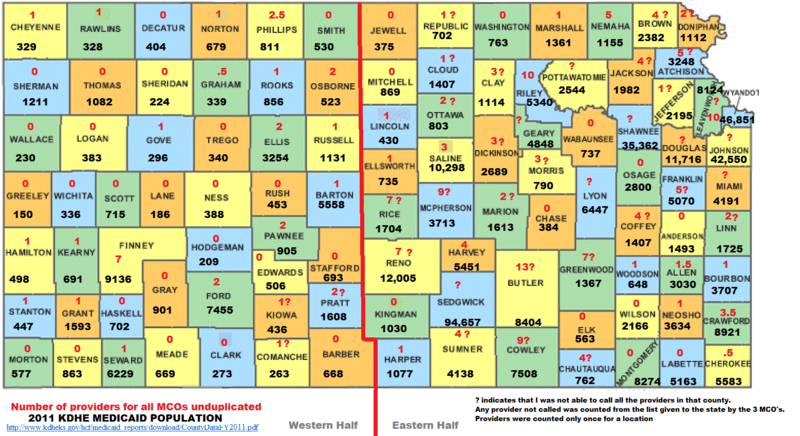 The map includes the Medicaid population in each county as of 2011 in black and the number of dental providers she was able to contact who still accept Medicaid, which in Kansas is called KanCare, in red. At 59 years old, Bill Miller is starting to have neck and back problems. Thirty-two years of bending over to check patients’ teeth and gums will do that, he said. Miller is the only dentist in Hill City, a community of about 1,500 people northwest of Hays. He has treated Medicaid patients his entire career, even as reimbursements increasingly have lagged the cost of providing care. Earlier this year the state cut those reimbursements another 4 percent as part of a host of emergency budget-balancing measures. Miller said that has him seriously considering dropping out of the Medicaid program. As the Legislature prepares to reconvene Jan. 9, Gov. Sam Brownback and lawmakers have a few ideas for restoring the 4 percent cut but have yet to agree on any specific plan amid larger budget problems. Meanwhile, medical providers are weighing whether to continue seeing Medicaid patients — decisions that have the greatest impact in specialties like dentistry, and in rural places like western Kansas where many patients already drive hours to find care. It’s not the first time Medicaid reimbursements have been cut in recent years. Gov. Mark Parkinson, a Democrat, slashed them by 10 percent in 2009, when the state was trying to weather the Great Recession. But he and the Legislature restored the cut within months by passing a sales tax increase. Brownback said in August that the 4 percent cut could be reversed if the Legislature agreed to increase a hospital tax, which would pull down more federal Medicaid money. Last month he reaffirmed that remains his preference. “We still would like to do something like that,” Brownback said. Legislators have been cool to that idea so far. Rep. Dan Hawkins, a Republican from Wichita who chairs the House Health and Human Services Committee, said that wasn’t the right way to find the $40 million needed to restore the cuts. Instead, Hawkins suggested increasing a fee levied on the three managed care organizations (MCOs) that administer Kansas Medicaid, or KanCare. That fee increase also draws down federal money — in this case, Hawkins said, enough to both pay back the MCOs and restore the $40 million cut. “I think that’s a place we could look at that would not really affect anybody,” Hawkins said. That particular fee, though, also applies to private-sector insurance companies that run managed care plans, including health maintenance organizations, or HMOs. The Legislature passed a bill last year that gave those companies the ability to sell HMO-like plans without paying the fee, but Hawkins said a couple of them —Blue Cross and Blue Shield of Kansas and Aetna — still sell the traditional HMO plans that would be subject to the fee increase. Brownback said that should be taken into account, but he didn’t rule out including Hawkins’ idea as part of a plan to restore the 4 percent cuts. Mary Beth Chambers, a spokeswoman for Blue Cross and Blue Shield of Kansas, said her company would be less affected by a fee increase than some other insurers, because it only sells the HMO plans on the individual market and they make up a small part of the total business. Hawkins said another option is to repeal a provision of Brownback’s signature 2012 tax plan that exempted about 330,000 business owners from paying any tax on “pass-through” business income. That idea was part of a budget-balancing bundle promoted last week by a coalition of advocacy groups at the Statehouse. Hawkins said repealing the business tax exemption would bring in about $260 million, of which $40 million could be diverted to restore the Medicaid cuts. But the state faces a budget gap of about $350 million in the current fiscal year and about $600 million in the next fiscal year, which begins July 1 — and that could swallow new tax revenue. 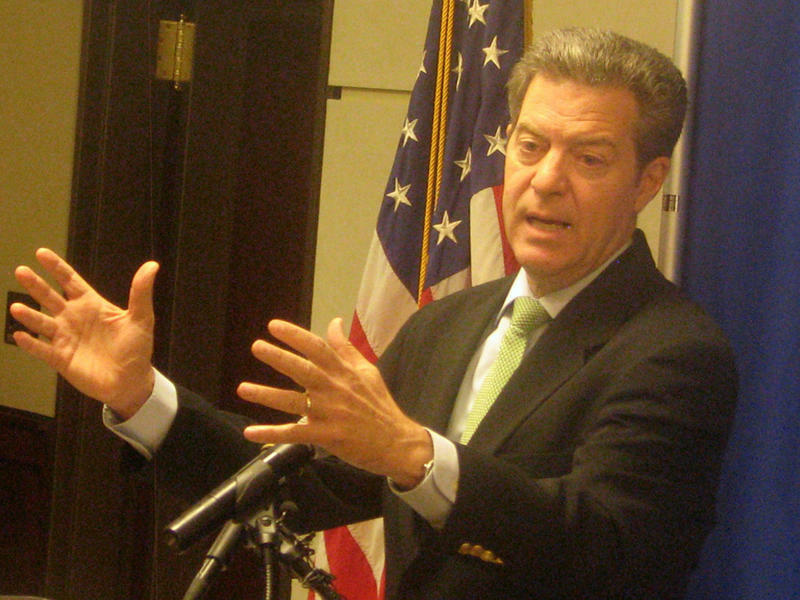 Brownback has opposed proposals to roll back the 2012 cuts in the past. His office has said it is working on a budget plan to be released soon. The 4 percent Medicaid cut hit a variety of providers: hospitals, nursing homes, psychiatrists and others. But opposition has been particularly strong from dentists, who have not seen an increase in their Medicaid reimbursement rates since 2001. Even before the 4 percent reduction, Medicaid paid about 40 cents on the dollar compared to private dental insurance. Nick Rogers, an Arkansas City dentist and president-elect of the Kansas Dental Association, told the Robert G. (Bob) Bethell Joint Committee on Home and Community Based Services and KanCare Oversight last month that the cut was likely to be a “final straw” for dentists who were leaning toward getting out of Medicaid. He said access to dental care was already an issue for people on Medicaid in his part of the state — especially for Kansans with disabilities. Rogers said his practice was getting referrals for patients with special needs who live more than two hours away. His testimony echoed comments made months earlier by John Fasbinder, a Prairie Village dentist who also treats disabled Medicaid patients. Melinda Miner, a dentist from Hays, told the committee that the dental provider networks in western Kansas are close to collapsing in many communities. After contacting dentists throughout the region, Miner compiled a map showing more than 20 western counties without a single dentist who accepts Medicaid. Miner said in an email that she is among two dentists in Hays who have decided to stop taking it. She provided the names of two other dentists, one in Leoti and one in Great Bend, who she said have also dropped out of the program and eight more western Kansas dentists who she said are considering dropping out. Miller, the dentist from Hill City, is one of them. Craig Sandlin is the office manager for his wife, Joanne Brown, the Leoti dentist. He confirmed that they stopped taking Medicaid patients as of the end of November. Sandlin said the move affected more than 2,500 people and he’s not sure how far they will have to travel to find a dentist who takes new Medicaid patients. Michael Jones, a dentist in Russell, said he’s limiting his intake of new Medicaid patients to “very, very few” and is strongly considering not taking any more. He said he treats Medicaid patients at a financial loss, but does it as a service to the community. A young dentist just starting out, with potentially more than $100,000 in student debt, would not have that option, Jones said. He said it would be tough to find someone to replace him when he retires. “Selling the small, rural practice is very difficult,” Jones said. Sandlin said that once dentists get out of Medicaid, it will be hard for the state to bring them back, even if the reimbursement rates do increase. He and his wife are paring staff now, and it would take more than a restoration of the 4 percent cut to convince them to rehire — in fact, it would take a substantial increase. On this week's episode of Statehouse Blend Kansas, newly elected Rep. Cindy Holscher (D-Overland Park) discusses the LLC tax loophole, Medicaid expansion, and school finance.